If the songwriter and TV moderator Lakis Jordanopoulos would take a musician to the famous island, it would be under guarantee Hakan Gürses. The attained doctor of philosophy is the ideal multi-instrument-player (bouzuki, guitar, flute and ud) and also the "high" voice contrary to the bass of Lakis Jordanopoulos. 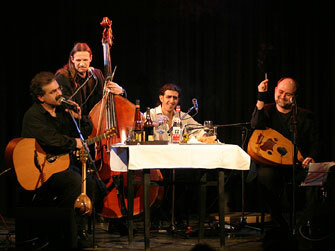 Since over 20 years the greek and turkish soul of "Lakis & Achwach" meets on stage. Not only in music, also in humour and the affectionately handling with equality and difference of their cultures. Just as long Lakis Jordanopoulos makes music with Herwig Thoeny from Liechtenstein, called by his friends "the duke". With his doublebass he is responsible for the groove of the "Tsatsiki Connection". It is whisperd, swiss cheese is the great passion beside tsatsiki. The members of the "Tsatsiki Connection" played in many bands, but now the pure joy of music brought them together. Without complicated technology but with fine arrangements, without a show on stage but with humour and charm it becomes an evening with the passion and fire of the mediterranian way of life.